Remember me? I flew from Atlanta to Philly on July 2002 and got Zoë, our cream poodle (we thought she would be apricot but she turned cream). I want to let you know that Zoë is an integral part of our family and is adored by everyone. 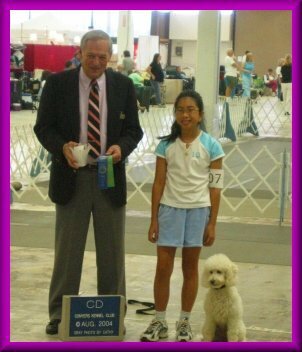 She’s great with our two children and has recently placed 1st place in obedience competition and got her CD title with my 9 year old daughter, Sabrina. They placed 4th place on the first day, 3rd place on the second day and 1st place on the third day, achieving their title in three consecutive days! Sabrina was the only child competing in the competitions. Zoë and Sabrina is also training for an agility competition in September. They also training for open obedience. Needless to say, we can’t imagine our lives without her. Please let Camille know of Zoë’s progress. I was looking for Camille at the recent Jonesboro, GA. Show, but she didn’t attend (it was a little hard looking for her since I’ve never met her).